Rabbits were immunized with a synthetic peptide representing amino acid residues 410-419 (EQKLISEEDL) of human myc conjugated to KLH. Antibody was isolated by affinity chromatography using the peptide immobilized on solid support.Antibody concentration was determined by extinction coefficient: absorbance at 280 nm of 1.4 equals 1.0 mg of IgG. Detection of c-myc-tagged Protein by western blot. Samples: 200, 100, or 50 ng of E. coli whole cell lysate expressing a multi-tag fusion protein.Antibody: Affinity purified rabbit anti-c-myc antibody A190-105A used for WB at 0.04 µg/ml (1:25,000). Detection: Chemiluminescence with an exposure time of 3 seconds. 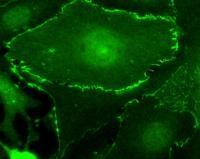 Detection of c-myc Tagged Plakoglobin by immunofluorescence. Samples: Human microvascular endothelial cells expressing c-myc tagged plakoglobin following transient transfection.Antibody: Affinity purified rabbit anti-c-myc (Cat. No. A190-105A) used at 1 µg/ml. Detection: FITC labeled goat anti-rabbit IgG (h+l).